Eastern Star was in fantastic condition today and what value for money – we will be back for sure. I have never seen the greens as good as they were on this day and having played this course for the last 20 years that is a big statement, but also very true. With four groups playing we were away a little earlier than out tee time and were back in just under four hours in perfect conditions. There were the usual tales about lost balls but that is standard for this course it can be very daunting looking at water on one side of the fairway and out of bounds on the other, that’s why it’s such a great course to play. 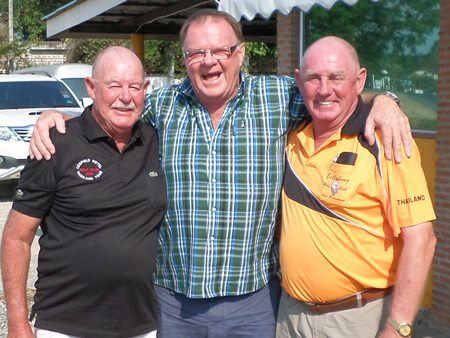 Rob Kershaw, Chris Dodd and Capt Bob. Coming in third spot today was Capt Bob with 35 points, being beaten on a count back by one of the Fremantle lads, Robbie Kershaw, with 35 but having 16 points on the back to Bob’s 15. First place went to birthday boy Chris Dodd – I think the 24 points on the front nine was the catalyst for this win and that score beat 3 other golfers total for 18 holes. There was just one birdie ‘2’, coming from Alan Bartlett. Green Valley on Wednesday and by popular request we played a rainbow stableford event and the girls joined in also, but still played their own separate tournament. The scores were not as good as you would expect, with only the high 30s taking the spoils. There were nine ladies playing and in that division coming in third place was the birthday girl Liz Collier with 25 points on a count back over Eng Cotterell. Second went to Jittina Tinpranee (Orn) with 31 points also on a count back With Y. Sakulthip (Thip) taking first spot on the same score. The men’s competition went down to fifth place with Wayne Cotterell getting that spot with 34 points. Fourth went to Bob Philp with 35 points, again not being able to put a respectable back nine together, third to Kevin Hamilton with 37 and Greig Ritchie was second on the same points total but a better back nine. In first place was Sel Wegner with a fine 38 points. There were four ‘2’s, coming from Greig Ritchie, JP Maffray, Wayne Cotterell and John Player. We travelled up 331 to Pattavia today, and apart from a five-hour round it was a good day out. The course was in great condition, with the greens there normal speed (as in extremely fast). With four groups playing we got away 30 minutes earlier than our tee time and all had a good day, even though it was a little slow. To change things today we had two near pins kindly sponsored by Mal Farquharson, the birthday boy. He picked the holes and chose number four and thirteen, a good choice, and they were won by Andrew Woodall on four and Steve Erdelyi on the thirteenth. We went down to third place in the prizes, with third being won by Capt Bob with 36 points. Alan Bartlett took second with 36 also but having the better back nine and first place went to Barry Lewis, his first time ever in the winner’s circle, with 37 points and he promptly rang the bell to celebrate. There were three ‘2’s, coming from Chris Dodd, Steve Erdelyi and Andrew Woodall. Note: The Billabong is situated just off Siam Country Club Road looking straight down Lake Mabprachan. Give Bob a call on 082 204 3411 if you are looking for a game. All are welcome and we have a lot of ladies also play with our group.